Figure 19.3. Changes in monoclonal protein expression at MM relapse. dFLC: difference between involved and uninvolved FLC levels. (Reproduced with permission from the British Journal of Haematology  and John Wiley & Sons Ltd). Figure 19.4. 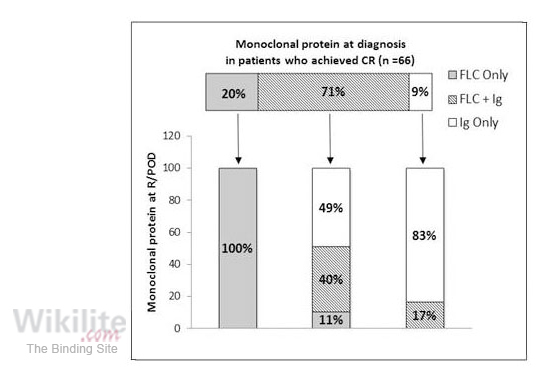 Changes in monoclonal protein type at relapse or progression of disease (R/POD). (Reprinted by permission from Macmillan Publishers Ltd: Bone Marrow Transplantation  , copyright 2013). Figure 19.5. sFLC analysis and total IgA concentrations over the course of treatment and disease relapse. The dominant clone present at each disease stage is shown. Red arrows indicate relapse (R1-R4) and remission (Rem). SGN-40: dacetuzemab; MPV: melphalan, prednisone, bortezomib; CyBorDT: cyclophosphamide, bortezomib, dexamethasone; D-PACE: dexamethasone, thalidomide, cisplatin, doxorubicin, cyclophosphamide, etoposide; CyBorP: cyclophosphamide, bortezomib, prednisone. (This research was originally published in Blood  © the American Society of Hematology). The earliest observation of changes in monoclonal protein production during MM disease evolution was published by J. R. Hobbs in 1969 from his analysis of the first MRC MM trial . He described the phenomenon of Bence Jones escape (FLC escape) in 15 patients at disease relapse, in which the serum intact immunoglobulin concentration reduced, but Bence Jones proteinuria dramatically increased. This phenomenon is further discussed in Section 18.2.1. In accord with Ayliffe’s phenotyping of clones based on their protein expression , both Hobbs  and Brioli  used serum protein measurements as indicators of clonal change during the course of a patient’s disease. 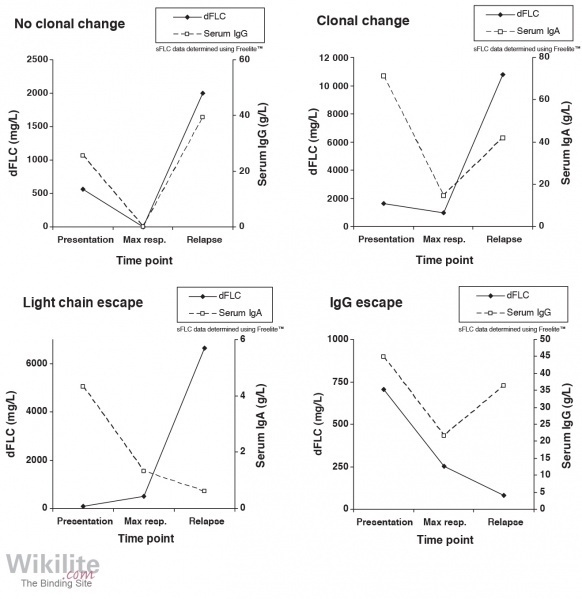 In an analysis of the MRC VII trial, Hobbs  suggested three classifications of clonal evolution: 1) light chain escape - an increase in sFLC concentrations without a corresponding increase in intact immunoglobulins; 2) intact immunoglobulin escape - an increase in monoclonal intact immunoglobulin without an associated increase in sFLC; and 3) clonal change - a change in the relative proportion of monoclonal intact immunoglobulin and sFLCs (Figure 19.3). In a larger study of 520 IIMM patients at relapse, Brioli et al. reported that 183 (35%) had a significant increase in intact immunoglobulin and sFLC levels, 258 (50%) had an increase in intact immunoglobulin only and 54 (10%) had light chain escape. Similar patterns of serum protein changes were reported by Zamarin et al. in a study of 66 patients (Figure 19.4). Importantly, this study included patients with LCMM. There was no evidence of clonal change in the LCMM patients, suggesting that loss of heavy chain production represented a terminal genetic event. The case report by Keats et al. and Egan et al. described below provides evidence of the relationship between the genotype and phenotype of the disease. Alternating dominance of competing myeloma clones . Both Keats et al. and Egan et al. described the case of a 67-year-old woman with MM who was monitored closely during the course of her disease using sFLC analysis and total IgA assays. In addition, at 7 time points, genetic analysis of tumour plasma cells was performed using array comparative genomic hybridisation (aCGH) and fluorescence in situ hybridisation (FISH). This enabled the comparison of genetic changes in the competing tumour clones with the serological monoclonal protein changes (Figure 19.5). At diagnosis, a bone marrow biopsy revealed a plasma cell content of 25%. Tumour cells were comprised primarily of one clone (termed ‘1.1’) but minor sub-clones (1.2 and 2.1) were also detected, both with a frequency of approximately 10% of the myeloma cells. At this point, both total IgA and the κ/λ sFLC ratio were abnormal. The patient responded to treatment with lenalidomide and low-dose dexamethasone, achieving a partial response. Relapse (R1; Figure 19.5) occurred after 22 months, with a change in clonal dominance (clone 2.1; 64%) and a subtle increase in both monoclonal IgA and FLC. During two subsequent relapses (R2 and R3; Figure 19.5), changes in the clonal composition of the patient's disease were characterised by an increase in monoclonal IgA, and a gross increase in the sFLC ratio. Interestingly, the dominant clone at R3 was 1.2, which shared a common progenitor with the original tumour clone. 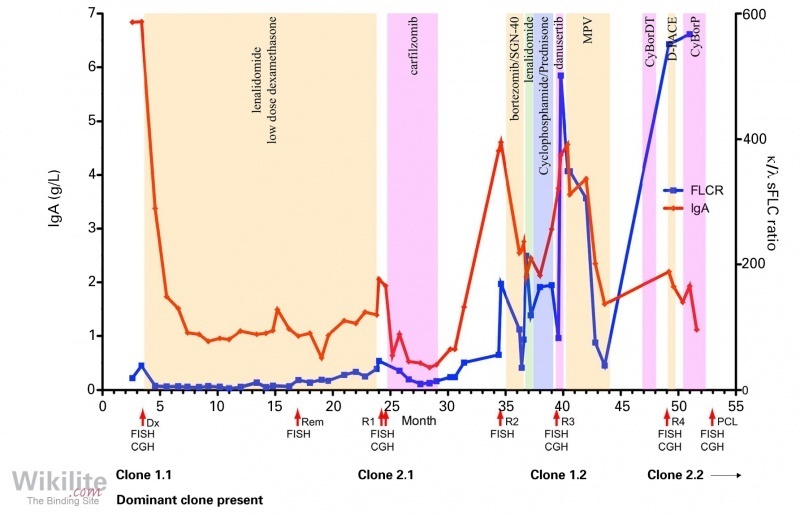 A final relapse occurred at 49 months (R4), characterised by the emergence of clone 2.2 and a dramatic increase in the κ/λ sFLC ratio. At 53 months, the patient progressed to secondary plasma cell leukemia (PCL; Chapter 22) with a further increase in the κ/λ sFLC ratio but no further change in the dominant clone present. The detailed study of this patient revealed that, at each relapse, a clone emerged which was distinct from the previously dominant clone. In some instances the new clone was related to a preceding one, with which it shared a common progenitor. Clones related to sub-clone progenitor 1 were present at diagnosis and relapse R3. Clones related to sub-clone progenitor 2 represented the majority of the tumour population at R1 and R4/PCL progression. The authors termed this pattern of progression as the “alternating dominance of two major clones”. In conclusion, for this patient, it can be seen that sub-clones present at diagnosis were responsible for the relapsing pattern of disease and the relative abundance of each clone appeared to be modulated by the therapy received. Genotypic analysis, although not readily available outside of clinical studies and academic centres of excellence, has revealed changes in the clonal architecture of the disease over time. In some MM patients, the genetic profile of the major clone present at diagnosis and relapse is identical . However, in other cases, the dominant subclone at diagnosis is genetically distinct from the dominant clone at first relapse, which can also differ from those seen at later relapses, as illustrated by the above case study. Corre et al. demonstrated that even if patients are treated with the same initial therapy, each myeloma subsequently evolves in a way that is genetically different from the others. In conclusion, MM is associated with huge molecular heterogeneity, including at the patient level, which can evolve over time. Although genetic sequencing is not routinely performed, the assessment of monoclonal protein production using sFLC analysis and intact immunoglobulin measurements are simple, widely available techniques that allow patients to be monitored for evidence of clonal evolution. What is the incidence of FLC escape?